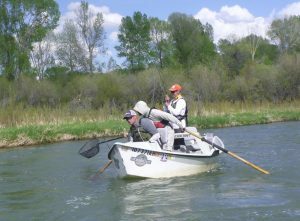 WorldCast Anglers Western Rivers Fly Fishing Guide School is an intense seven-day course, which takes place outside of Jackson Hole, Wyoming, an area with an amazing amount of trout water. The School is intended for those who wish to begin a career as a professional fly fishing guide or to extend their own personal fly fishing knowledge. It is a very unique school and the only one which truly prepares you for a life on the water — guiding. WorldCast Anglers offers three schools per season, and each school consists of two days of classroom activities and five days on the water. The classroom activities, an important aspect of the school, establish the foundation of your experience. Our guest speakers, experts, and instructors give you their own perspective on guiding. A psychologist, entomologist, casting instructors, whitewater expert, professional rescuer (CPR and First Aid certification), naturalist, and Trout Unlimited representative will cover everything from knot tying to whitewater rescue to cold water conservation as well as the other essential skills of a fly-fishing guide. For the five days on the water we have hand-picked five of our most experienced and knowledgeable guides to conduct the rowing progression. They are simply the best at what they do. Our rowing progression teaches the practical secrets and tactics for rowing a drift boat safely and efficiently while putting anglers in the best position to catch fish. River days consist of three day trips and an overnight trip on the famed South Fork of the Snake River, during which we will row and fish twenty-six miles of the Canyon Section and stay at our WorldCast Anglers camp (the “Cottonwood Camp”) — enjoying a great dinner, roaring fire, and fishing stories. Specific fishing tactics from a drift boat come to the forefront of the School during the river days. From dry-fly to nymph to streamer fishing, we will cover it all – the proper rod set up, the correct depth, and recognition of good trout habitat. We will also cover tippet, leader, backing, fly lines, rods, reels, waders, sunglasses, nets, and everything else to ensure guide and client success. At the end of the School, all of the students who finish the course will receive a diploma of completion, which represents a great accomplishment and a head-start toward a career in guiding. Instructors will also award a diploma of “Guide School Certification” to students who have excelled throughout the School and who are ready to guide wherever they chose. Students can use these diplomas for job placements locally or across the globe. WorldCast Anglers has placed guides in the best destinations in the world from Alaska to the Seychelles. Our school is Orvis Endorsed and world renown. Eighty-five percent of our graduates find jobs guiding. Fly fishing guides can earn a great living (top guides make $350+ per day), pay back any investment they make in boats and equipment, and see and work in some of the most beautiful locations anywhere. Check out this synopsis of the Western Rivers Guide School from spring 2014 student Jim Hissong! Contact WorldCast Anglers for more information on the Western Rivers Guide School including availability and detailed course description. Contact WorldCast Anglers via Email or phone 800-654-0676.